On Kaladesh, the Inventors' Fair—the intersection of creativity and genius—has begun. Inventors have flocked to the city of Ghirapur to take part in the event of a lifetime. This is their chance to see and be seen, to win over the hearts of the populace and the judges. The dedicated aether researcher Rashmi hopes to do just that; she needs the judges to believe in her creation if she hopes to leave her mark and change the world. The marvelous Inventors' Fair has the plane of Kaladesh buzzing with excitement - and now you can invite your favourite Magic The Gathering player to join the celebration. 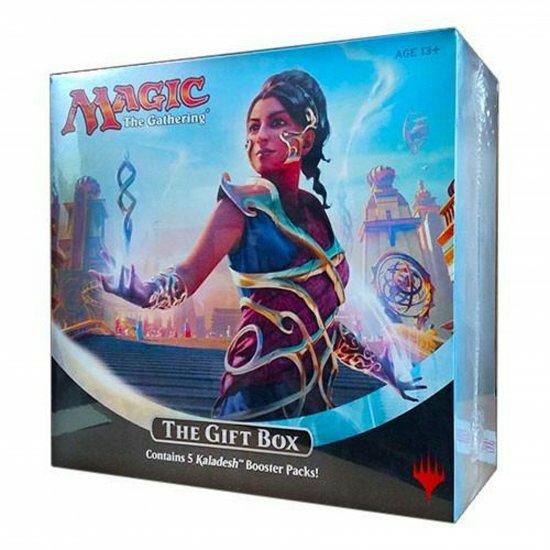 Put wondrous creatures, ingenious artifacts, and powerful vehicles at their command with the Magic The Gathering Kaladesh Gift Box. Able to hold over 800 cards, this box includes the tools every player needs to store, organize, and reinvent their collection.